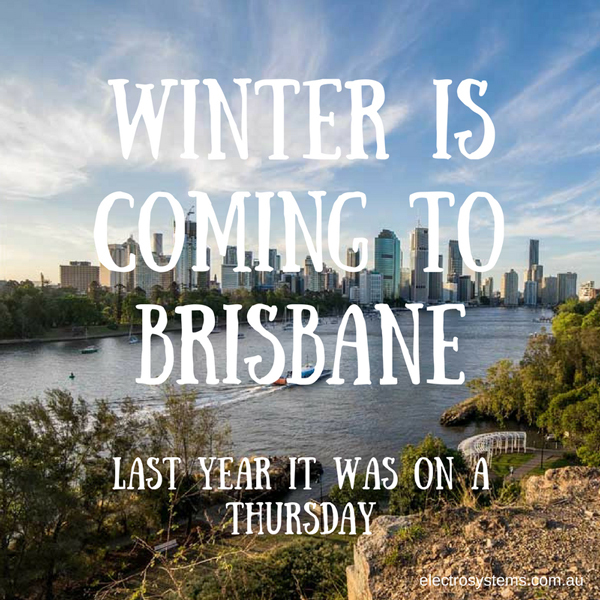 Winter is coming to Brisbane. Last year it was on a Thursday. We joke about winter in Queensland because compared to the southern half of Australia, we get off fairly lightly. With winter temperatures cruising comfortably between 11°C and 21°C residents of the city enjoy very mild chill during the cold season. That's not to say that we don't need some extra warmth every now and then. After a few years, many Queenslanders acclimatise to the weather and the heaters get fired up on those cold winter evenings. Only needing a heater for a few weeks of the year leads to a bit of a dilemma, do you invest in a gas heater or combustion heater to heat your home or just layer up with jumpers and blankets? The smart solution to install a reverse cycle air conditioner. A reverse cycle air conditioner provides your home with cooling during summer and warmth in winter all from a single appliance. This style of home heating is also one of the most environmentally friendly choices, producing one-third of the greenhouse gas emissions of standard electric heaters. Split system or zoned ducted designs help reduce your home heating costs by offering targetted climate control options as lots of energy can be wasted heating areas of the home not in use. Keeping the heating to rooms such as the living and office and turning off heating to the bedrooms during the day means your home can save significantly on power costs every week. Reverse cycle air conditioning is the most energy efficient electric heater option, averaging around $0.33 to $0.40 per hour to operate. Make sure you check energy rating when purchasing a new system, the more stars the better it's efficiency. It also pays to get some professional advice to ensure you purchase the correct size air con for the room you wish to heat/cool. Getting the right size will mean not wasting power running an air conditioner too large for the room or using too much energy trying to heat a room too large for the air conditioners capacity. use the ceiling fan - switch to the winter setting to help draw the warm air from the ceiling and recirculate it around the room. regular air conditioner servicing - keep your air con in top condition with regular maintenance to ensure your unit is working at peak efficiency all year round. We recommend scheduling your air conditioner service twice a year, at the beginning of winter and then again coming into summer. 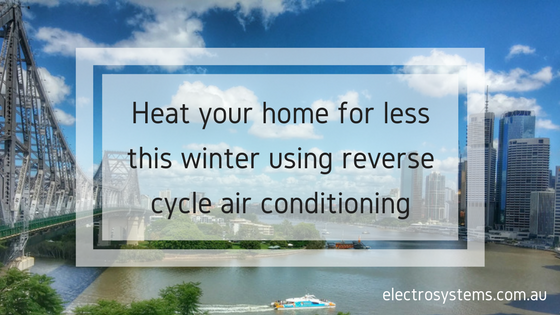 This winter, save on home heating costs by using your reverse cycle air conditioner to warm your home. If you'd like professional advice on the best air conditioner for your needs or to book a service before the cold weather hits give our experienced Brisbane electrical team a call on 3881 0956or complete our service request form today.